At first glance, it seemed a rather esoteric garden sculpture. The large basin sunk into the ground lined with stones invited the observer to climb down a spiral slope towards a mossy tree stump in the centre. 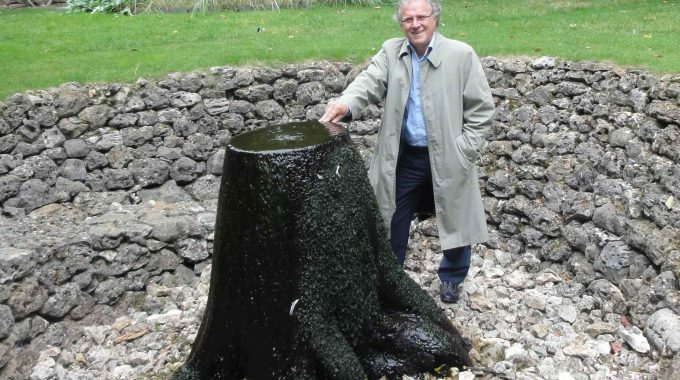 Water flowed from a hidden source out of the top of the stump spilling out on all sides down to the roots. Intriguing. This weekend I found myself on the trail of the Christian humanist scholar, Desidirius Erasmus. On Saturday a family outing to Deventer near our home brought us past the Latin school where the nine-year old Erasmus began his classical schooling under the Brothers of the Common Life. This renewal movement of the 14th and 15th centuries helped prepare the way for the Reformation with its emphasis on returning to the Scriptures and developing a personal relationship with Jesus. The still-extant school building in Deventer, the first school teaching Greek north of the Alps, was the font of secondary education in northern Europe, from which gymnasia in Holland and Germany as well as colleges in France developed. The Brothers from Deventer also helped establish universities such as in Tübingen and in Leuven where Erasmus later taught. On Sunday, an engagement at the European Student Forum in Brussels presented the opportunity to visit the Erasmus House in Anderlecht. Set in the quiet countryside when the famed scholar recovered from illness there for five months in 1521, today it is a suburb of Brussels. The original Renaissance red stone house is now a museum with paintings, sculptures and furniture from that era, including prints by Albrecht Dürer and oils by Holbein and Hieronymus Bosch. The study centre boasts early manuscripts of Erasmus’ works including first editions of The Praise of Folly, perhaps his best-known work. According to the signs in the garden, Erasmus was somewhat of a hypochondriac. A corner of the garden is devoted to medicinal herbs he collected for all sorts of ailments–headaches, kidney stones, the pest and much more. Shallow leaf-shaped ponds carried Latin messages in the form of bronze letters raised above the surface, quotes from the scholar such as: Ubi amici, ibi opes (your wealth is where your friends are), or Difficilia Quae Pulchra (difficult things are beautiful). And as centrepiece of the garden was that enigmatic sunken tree stump. At the time Erasmus stayed in this house, he had become the idol of Europe’s literary class, and was widely recognised as the ‘Prince of the Humanists’. Printing houses pursued him for his latest books. Universities, cities and royal courts vied for his services. The future Emperor Charles V had appointed him his chancellor in 1516. He had been fêted in Paris, Cambridge, Leuven, Venice, Turin, Rome, Padua and Basel. He was offered many positions of honour and reward, including that of cardinal. But he declined them all and the security they offered. For Erasmus had one driving passion: to renew the Church and Christian Europe by returning to the primitive model, the source of the Christian faith, to the original texts and the early Church fathers. The fundamental ideal of the Brothers–a sincere and faithful pursuit of Christ–remained with him all his life. They instilled in him a deep dislike of dogmatic argument, of a scholasticism that drew inspiration more from Greek and Roman classics than from Scripture, and that degenerated into theological hair-splitting and intellectual gymnastics. Those who think of Erasmus as the prototype rationalist, a free-thinking humanist critical of the church and its religion, an early Voltaire, a hero of the Enlightenment, miss the point. Yes, he was critical of religious rituals and theological squabbles, not as a doubter but for the reason that they diverted the faithful from the central message of the gospels. While sympathetic to many of Luther’s complaints about the church, Erasmus championed unity, peace and charity in all things, and refused to be party to Luther’s belligerence. For orthodox Catholics he was too soft on the Reformers. For the Reformers he was too cowardly to join them. Yet the vast majority of his writings, which would fill two metres of shelf space, focussed consistently on the ‘philosophy of Christ’– the teachings of the gospels. His life motto was: Christum ex fontibus praedicare, to preach Christ from the sources. And that, I realised, was what the garden sculpture was all about: getting down to the roots, the true source of living water, …ad fontes!